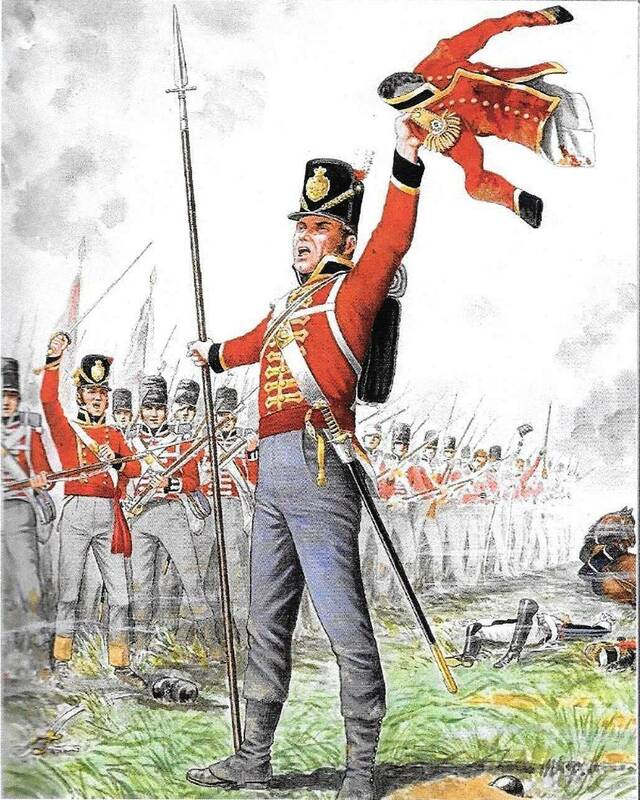 Our ‘story’ commences, in Hereford, on 23rd April 1797, when a young Charles Wood aged 17 enlists with the 1st Regiment of Foot Guards, commanded by the Duke of Gloucester. His occupation was stated in his enlistment papers as “labourer”, but his bold signature seems to belie this. He is detailed as being 5ft 8ins tall with grey eyes and light hair. The form assumes him to be of the Protestant faith and a doctor confirms him to be “fit for his majesty’s service”. His service in the Army indicates rapid promotion to the rank of sergeant, and we find him as Colour Sergeant at the Battle of Waterloo, where he served with distinction. It was virtually impossible for a person from his background to progress much further as the Army, unlike the Navy, was not a meritocracy requiring money and influence to obtain a commission. 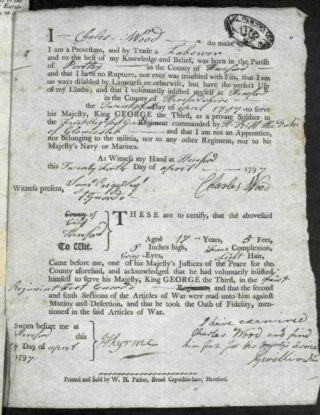 Charles Wood’s active career is confirmed in his beautifully written will of 1855, in which he makes bequests of medals earned in Holland, Italy, Walcheren (an ill-fated campaign in which at least one prominent Hertfordshire family lost a favourite son) Spain, Portugal and France. Another bequest was of a musket ball “which struck me in the sortie of Bayonne 14th April 1814″ (This pointless battle was fought after Napoleon had abdicated on the first occasion). Our hero left a long account of Waterloo in the form of a letter to an acquaintance, which he wrote on 29th July whilst encamped in Paris and was subsequently published. This letter contains much detail of the battle – too much for mention here. He starts two days earlier mentioning some casualties amongst his comrades and the commencement of a march at 4.00am of, some, 24 miles and then straight into action. His battalion, in common with others, suffered terribly from the enemy cannon fire, the French gunners often firing bundles of horse nails to maximise casualties. French heavy cavalry – cuirassiers – threw themselves upon the infantry squares, but were repulsed without making any impression. At one point when the British line appeared to be wavering, Charles Wood picked up the bloodied tunic of an Ensign Pardo, who had recently been killed, and waved it, calling to the men that “while our officers bled, we should not recon our lives dear”. The culmination of the battle saw Napoleon committing his choice 10th Regiment, which was “cut to pieces”, and then his Imperial Guards which were similarly dealt with causing those who had not been killed to run “very fast”. Charles Wood mentioned that after the battle he “had the honour to wear a colonel’s sword of the French Imperial Guard”. 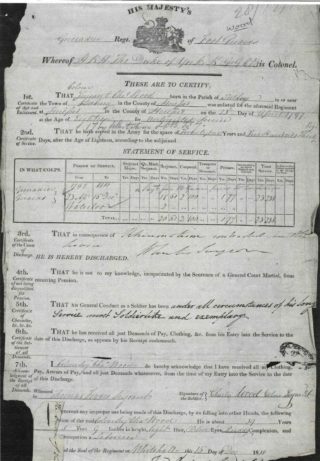 In December 1818 Charles Wood received an exemplary discharge due to “rheumatism contracted in the service” (no doubt due to many nights spent sleeping in wet clothing under a single blanket). 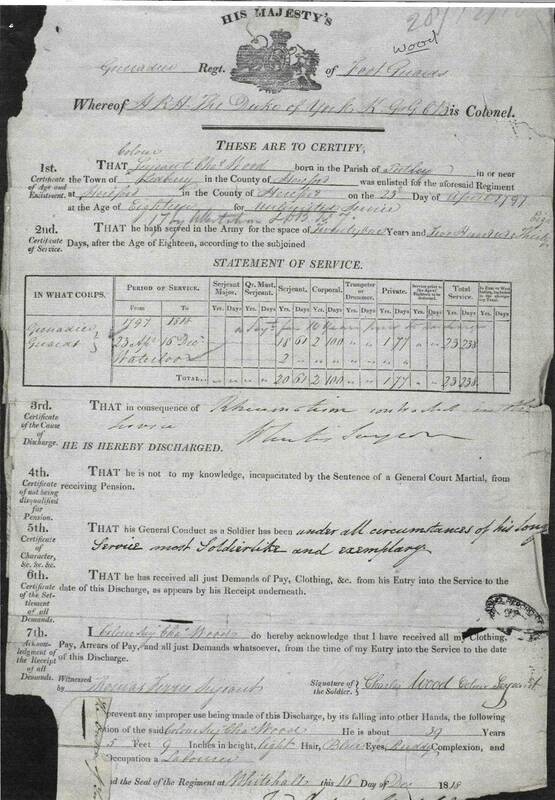 The 1841 Census finds our hero living in Stapleford and described as a “Farmer”. Living with his wife Susannah, they have two sons and two daughters. Then in the 1851 Census we find Charles living in Bengeo – by now aged 71 – with his wife Sarah (his previous wife Susannah having died in 1842) and two very young daughters. Interestingly, his occupation is described as “Staff Sergeant of Chelsea Hospital”. 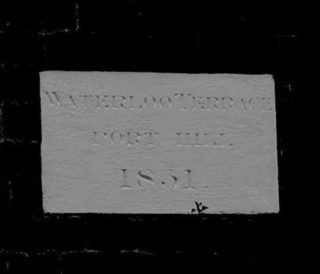 Charles appears to have been shrewd since becoming a civilian as his will indicates that he had cause to be erected (opposite the Co-op in Bengeo) ”seven brick built cottages” AND “two freehold cottages in Bengeo Street”. It is worth mentioning also that amongst his bequests are two “colours” doubtless captured from the French. 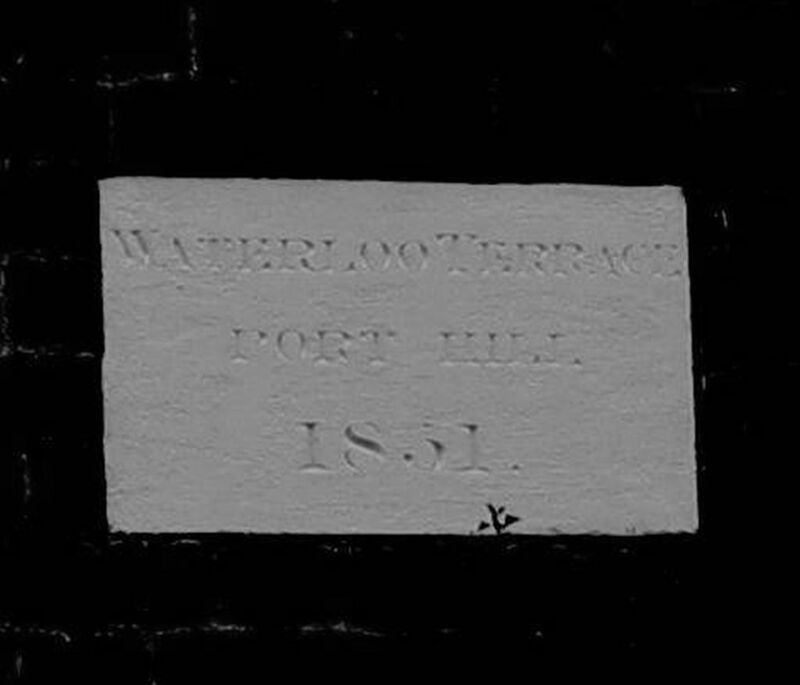 Charles Wood became a teacher at Watton School in 1825 and was appointed registrar for the Watton District, later in 1837. He died in November 1856 and was buried in Holy Trinity graveyard, although records indicate that he was an ardent methodist. WITH GRATEFUL ACKNOWLEDGEMENT TO MARILYN TAYLOR – LOCAL HISTORIAN – FOR HER KIND ASSISTANCE IN PREPARATION OF THIS ARTICLE. This page was added on 15/06/2015.